In the wake of Facebook pushing updates to its Android app directly from the app itself without going through the Android play store, Google has updated the developer policies. Google has added a condition to the developer policies saying that an app downloaded from Google Play can not update itself. Google new policy makes it clear that apps downloaded from Google Play can not update themselves and they have to go through the play store route. Facebook earlier has pushed updates to its app directly from the app itself without going through the Play store. 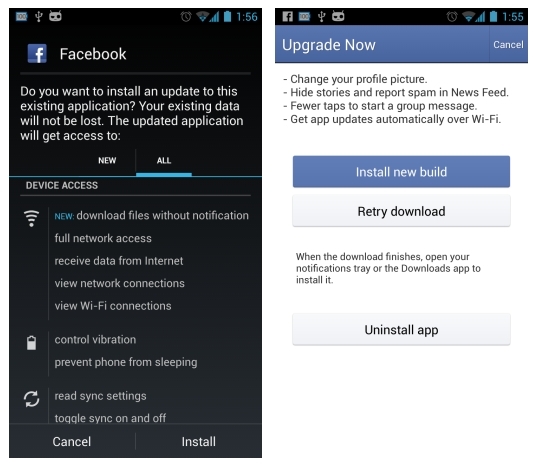 Facebook app updates show up only when users on Wi-Fi connections and upon clicking the update they will show what has changed and whether you want download the update. Obviously this didn’t go well with Google, as the same mechanism might be applied by other developers to push updates to their apps.